Chief Minister Jai Ram Thakur called on Union Minister for Road Transport and Highways Sh. Nitin Gadkari at New Delhi today. The Chief Minister discussed and reviewed important issues related to the State pending with the Ministry. 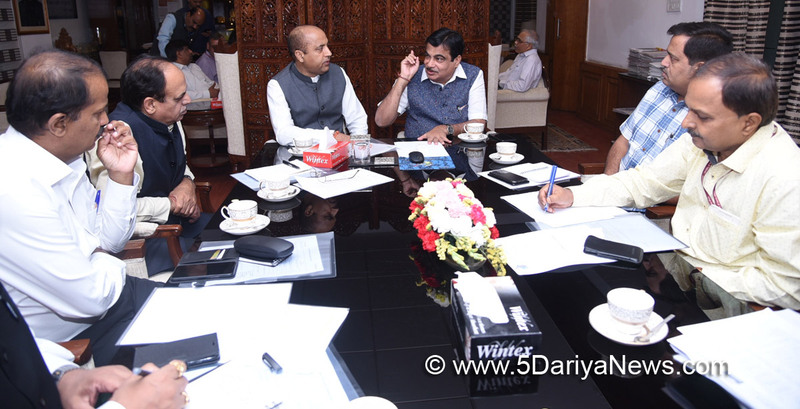 Senior officers of Ministry of Transport and Highways were also present in the meeting.Shri Nitin Gadkari asked the officers to complete all the formalities for construction of new highways approved for the state. He also directed the authorities to ensure that in view of tourist season repair and construction work on national highways should be undertaken in such a way that there was no inconvenience to tourists coming to the State.Keeping in view the topography of Hill States and occurrence of accidents, the Chief Minister Shri Jai Ram Thakur urged the Union Minister to make a concrete policy on road maintenance and road safety. The Chief Minister also urged the Union Minister to set up a special fund under Central Road Fund (CRF) for improvement of identified black spots and also to erect Crash Barriers alongside the roads in the state. The Union Minister approved the suggestion in principle. He also urged the Union Minister to approve the revised proposal of the state government to give Rs. 300 crore to the state instead of 210 crore in CRF. The Union Minister gave his approval to this proposal.Shri Nitin Gadkari also instructed the National Highways and other senior officials of his Ministry to hold a meeting in Shimla in first week of May with Officers of the state.Chief Minister expressed gratitude to the Union Minister for approval of 69 new National Highways for Himachal Pradesh.